NRN German Organized It’s Annual General Meeting, Decided Not To Select Leader On Groupism Distribution - Integration Through Media ....! Hamburg, Germany: The annual general meeting of Non-residential Nepalese Association (NRNA) National Coordination Council of German was held in Hamburg on July 20th .The meeting was chaired by the NRNA-Germany President Mr. Harendra Wanem where the founder president Mr. Dil Bahadur Gurung was the chief guest of the program. Likewise, Som Sapkota the Vice co-coordinator of the NRNA Europe was the special guest of the program. Other guests who were present in the program are NRNA -ICC member Dawa Sherpa, former ICC member Santosh Bhattarai, NRNA major guardian of Germany Pushpa Thapa, a special guardian Bijay Shrestha, guardian Ran Bahadur B.K,Shikhar Khadka from Internation Artist Society Germany,Chairman of International Artist Forum Germany Bel Gurung,Tanka Lamsal from Jana Samparka Samiti and various representatives from the different social organization around the Hamburg city were present . The general secretary of NRNA-Germany, Hari Sapkota has hosted the program, whereas Prem Pomu has managed the administration and operation tasks. NCC Vice President Surendra Pradhan has delivered the welcome speech, whereas the artist Asma Dangol has presented her beautiful dance. The chief guest of the program Dil Gurung talked about the contribution that NRNA-Germany has given from the day of establishment. He told that the conception of National Co-ordination Council, 75 districts, one charity project conception,mutual investment conception, the issue of the continuation of the Nepalese citizenship, send home to your friend’s conception to promote tourism in Nepal have started from Germany. NRNA Germany should be proud of his history, he emphasized the achievement and contribution . He further told that the selection of the upcoming representatives for the International Coordination Council shouldn’t be done on the basis of groupism distribution, it should selected on the basis of the contribution he/she is making on the non-residential movement. Special guest Som Sapkota remarked that the representatives from the Germany can play important role in the upcoming NRNA World Summit so he wished that the selection of the leader be without any dispute. 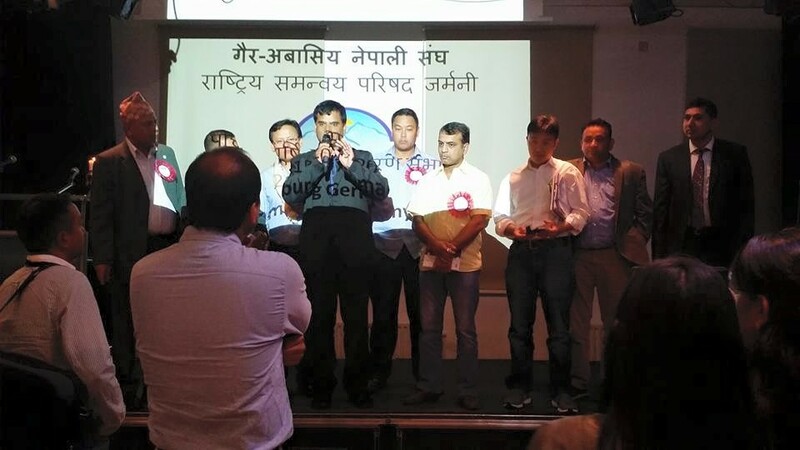 Other person who delivered the speech were ICC member Dawa Sherpa, former ICC member Santosh Bhattarai, guardians of NRNA Germany Puspa Thapa and Vijaya Shrestha and Manav Lal Shrestha representing various organization. The progress reports of the various Local Co-ordiantion Committee under NRNA-Germany were also presented in the program. Bayern Coordinator Prem Kandel, Hessen coordinator Lok Mani Dhakal, NRW coordinator Dipak Lama, Bremen Niederlassung coordinator Krishna Devkota, Berlin-Brandenburg secretary Rajesh Sunwar and Hamburg coordiantor Chiran Shrestha have presented their respective LCC progress report.After hearing the progress report of various LCC the program has also congratulated them and wished for success for the upcoming tenure. Participating in the discussion program NRNA-NCC Tanka Lamsal, IT Professional of Berlin Dr. Jay Krishna Thakur, Netra Bhandari from the University of Goettingen, Bikash Thakuri NRW vice coordinator,Binay Gurung and Manav Lal Shrestha have talked about the extension and purification of NRNA-Germany. NRNA-Germany Treasurer Narayan Adhikari has presented the financial report in the program, whereas, patron Puspa Thapa has presented the amendment proposal of the their rules and regulation. After the financial report was passed there was the discussion program on the purposed amendment rules and regulation of the NRNA- Germany. Participating in the discussion program Santosh Bhattarai, Bikash Thakuri and others commented on the purposed amendment rules. European vice-coordinator Som Sapkota suggested to amend as getting matched with the rules of the ICC. Finally, it has decided to continue the discussion on the collected suggestion in the NRNA-Germany committee to consolidate it and decided to endorse the revision for decision in the next assembly. NRNA-Germany President Harendra Wanem has thanked and congratulated the program organizing committee and the participants’ guests for their contribution to make the program better.